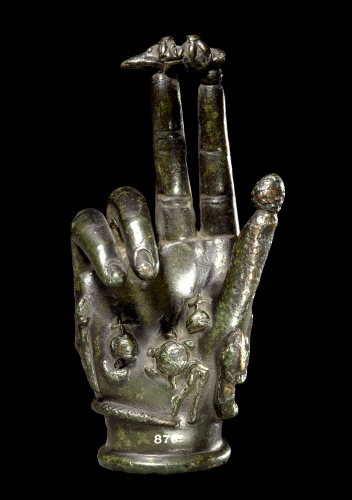 The upper picture is one of the more famous talismans in the British Museum, a late Roman bronze “Hand of Power” or Mano Panthea sculpted in the round. The defining quality of the Hand of Power in its many forms is that it invariably is shown standing upright upon its severed wrist and is adorned with various zoomorphic and utensil forms. This hand — a right one — makes a sign of benediction, the thumb and first two fingers upraised and the last two fingers curled down. There is a small pine cone balanced on the tip of the thumb and a large crowned snake crawls up the back of the hand and arches over the bent ring and little fingers. Other animals and objects covering the rear of the hand in high relief include a lizard, a worm, a salamander, a frog, a caduceus, a fasces, a turtle, and a group of urns. The view shown here is from the rear, which complements pictures of the same object in other books, where it is photographed from the front. The front of this hand (see the anonymous Octopus/Crown Books “Encyclopedia of Magic and Superstition”) bears a ram’s head, a sprig of mistletoe, a woman nursing a baby wrapped in swaddling clothes, and a curious table with human legs upon which rest three disks (votive food offerings?). For a sketchy drawing of a similar late Roman bronze Hand of Power see Elworthy’s “Horns of Honour” (reprinted as an illustration in DiStasi’s “Mal Occhio”). This latter Hand features a pine cone on the thumb, a bust of wing-helmeted Mercury atop the curled-down ring and little fingers, a crowned snake wrapped around the thumb, a caduceus, a turtle, a frog, a balance beam scale, an urn, a sprig of mistletoe, and what may be a salamander. The Hand of Power continues in popularity today as the Roman Catholic Powerful Hand or Mano Poderosa, which is sold on saint cards and applied to votive candles. In the modern Catholic version, the fingers are all stretched upright, as is the thumb, and various saints and angels are standing on and around the digits. The upright-facing Hand of Power is generally considered to be benedictive in nature, but it also conveys magical protection to the household. When the hand is shown making the gesture known as the mano fico (“fig hand” in Italian), it acquires the apotropaic evil eye repelling quality of that gesture. Life-size Hand of Power statues, loosely modelled on the one shown on this card, are offered for sale by several modern Pagan/Wiccan supply sources. One has a socket for a candle in the palm. 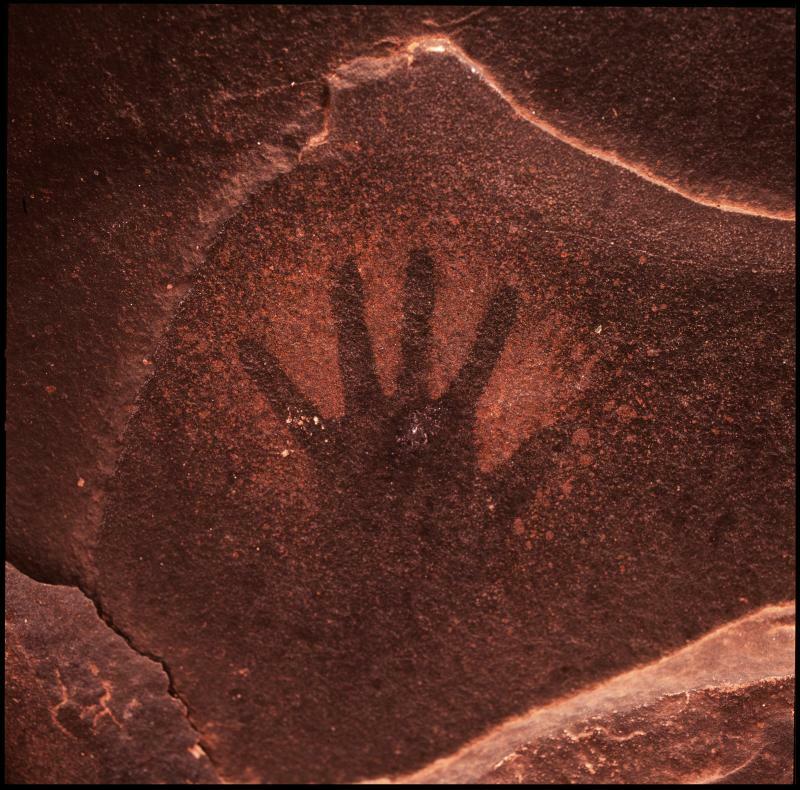 Paleolithic painting of the hand at the entrance of the cave for protection agains evil.